C.A.O. Cigars came from a humble, hardworking beginning where quality and innovation were key ideas. This has not changed. C.A.O. continues to make innovation, high-quality products ranging from humidors and pipes to their handcrafted and complex cigars. Founded in 1968, the factory is located in Esteli, Nicaragua. The beginning of C.A.O. Cigars is the story of Cano A. Ozgener—the founder and from whom the name is inspired. Raised in Istanbul, Ozgener attended the American Run Roberts College where he gained his BS in Mechanical Engineering before continuing on to Graduate School at Columbia University. Through his studies, Ozgener was introduced to cigars and enjoyed smoking as a way to unwind. It wasn’t until Ozgener accepted a job in Dupont, NC that he used his spare time and engineering background to perfect his preferred smoking method—the Turkish Meerschaum Pipe. In 1977, Ozgener left Dupont to focus full-time on C.A.O., which at the time was exclusively a pipe and humidor business. In the 1990s, C.A.O. gained more recognition after they released humidors with a state-of-the-art humidification system. Riding this boom, C.A.O. entered into the cigar market with Honduran cigar maker Nestor Plascencia and Nicaraguan grower Carlos Toraño. After the Cigar boom in the 1990s and their continued excellence, Scandinavian Tobacco Group bought C.A.O. Cigars in 2007. 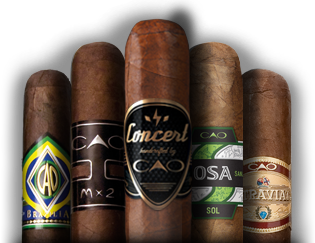 Ultimately, C.A.O was combined with other divisions in their premium cigar division in 2010 under the name General Cigar Company—one of the largest manufacturers of cigars in existence. What has this meant for Cano and family? Nothing. They continue to work together to produce the same high-end products expected of the C.A.O. name. The C.A.O. attitude of continuing to strive towards perfection shows in their exceptional products and the cigar community has taken notice—including Cigar Aficionado. Cigar Aficionado’s elite, annual Top 25 lists is applauded as being one of the most precise and selective tests of cigars conducted. With a panel of experienced and knowledgeable cigar experts and blind taste tests, the Top 25 is the best of the best. #17 C.A.O. L’Anniversaire 1968-1998 Cameroon Robusto (92 Score).